Super Hero Boy: Getting wet is always Connor's top priority. Getting wet is always Connor's top priority. Its officially hot here in Alabama and with warm weather comes Connor’s favorite activity of all time, getting wet. That leaves his Mommy wondering about safe ways for him to enjoy his favorite activity of all time, playing in water, without putting him at risk as thus far regardless of what he may tell you he can not swim quite yet. Not that he isn’t trying. 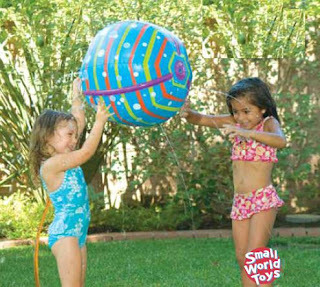 Small World Toys offers quite a few really cool and really affordable ways to keep cool this summer as well as some really fun outdoor toys that you really have to have. I really wanted to have something for Connor and his smaller cousins to play in at his birthday party that would be safe and no intimidating to his younger cousin. While browsing the Small World Toys website I found the coolest option that not only would be fun for the smaller children but its really portable as well. Once your done playing you can dry it off and fold it up small enough to fit into your beach bag to take to the grandparents house! The Active Edge Soft Sprinkles Tide Pool is genius! 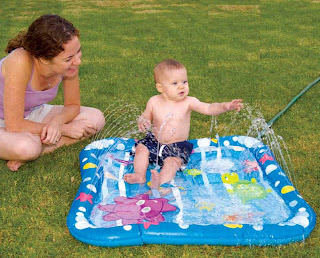 Though it only holds about an inch or two of water and the size is on the smaller side its perfect for babies and toddlers. Toddlers will love playing in the built in sprinkler around the edge of the pool and infants will love hanging out in the middle. Connor loves bringing all of his boats into the tide pool and sitting in the middle. Usually once we have it filled I turn the water almost down to a trickle from the faucet so we don’t waste too much water and surprisingly even with the water turned down low the sprinklers still shoot up a few inches. W hen its time to store the pool you just drain it and let it dry and then it folds up into a tiny square that will fit anywhere. Dads will love the fact that there is nothing to blow up.. Just attach it to the hose and it fills with water, no need to hyperventilate. A huge hit at the real birthday party was our Active Edge 18” Hoppity Ball. My dad first brought hoppity balls to my attention when he came home all excited about seeing a kid jumping on one in their driveaway. He had debated on stopping to ask the child where they got their ball then realizing that might freak them out, so of course he comes to my house exclaiming that we must get one for Connor. 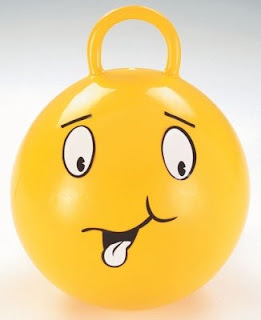 The Hoppity Ball is a great way not only to have some fun but exercise as well! Though Connor’s legs are just a tad bit too short for the Hoppity Ball at the moment he will be bouncing around the yard on it before I can blink I’m sure. In the meantime his cousins had a blast and the ball is sturdy enough to handle even the larger kids play. It comes in a 18 inch and 26 inch size for larger kids. Actually I’m half tempted to buy the 26 inch one for myself as I really need some exercise and I think it would be tons of fun to hop around the yard with Connor. If your looking for a unconventional way to cool off you really should check out the Active Edge Beach Ball Blast. Part beach ball part sprinkler the inflated beach ball squirts water in every way imaginable. You can throw the ball in the air or just lay it on the ground and play around it, it’s a whole new take on the traditional sprinkler toy. It comes with a smaller hose connector that makes throwing and passing the ball much easier than if it was attached directly to the main hose. When you turn it on it wiggles and giggles in your hands drenching you with water. It makes for a really fun game of hot potato! Heh. Check out all the great summer fun toys at Small World Toys! I have a Active Edge Beach Ball Blast to give away to one lucky reader! Leave a comment on this post. Check out Small World Toys and tell me what toy you'd most like to have for summer!! Make sure you read below to earn extra entries including a scavenger hunt entry. Answer the I Spy trivia question "Check out the Small World Toys and take a look at the Active Edge line of toys! I spy something that that makes a traditional table game wet and fun! Do not leave this entry in your comment all trivia question answers go to contestsatsevendogs@gmail.com. Use the subject "Small World" Posting "I spy" answers in comments will disqualify you! I'd love to have the Active Edge - Wigglin' Water Snake for Summer. It looks like a lot of fun! I would love to have the Small World Express - Fun Roller. That would be a lot of fun for the kids in the yard. The Active Edge - Wigglin' Water Snake looks super fun, and not just for the kids! My boys would like the Small World Express - Friendly Fighters. My friends had a toy just like the Hoppity Ball and it was my favorite thing to play with when I was at their house. I'd love to get one for my daughter when she's just a little older. I like the IQ Baby Chubby Choo Choo Train because it's bright and fun! The Active Edge - Easy Catch looks like something my kids would love, and it's a great outdoor toy! Great Giveaway! I found you listed on Sweepstakes Advantage. www.sweepsadvantage.com , Good Luck to everyone! I like the Small World Express 3 pc Sand Castle Set, it looks like fun for my kids in the sand. I'm VERY confused about the Birthday Post. The link take me to Amazon.com. The Active Edge - Loop-To-Loop Parachute would be fun to have for summer. I would love to have the Small World Express - Fun Roller for my kids!! The barnyard baby balls look like a lot of fun! The kids would love the Small World Express - Homerun Hitter. My kids would love that small world express-power arm! My favorite is the Small World Express - Fun Roller! Pomma Wonga sounds like oodles of fun!